The Appety line by de Buyer Professional brings innovative, multi-purpose cookware to every kitchen utilizing affordable, yet high-end materials. Professional quality stainless steel allows for the cookware to possess a magnetic-coated heat diffusing bottom. This bottom perfectly distributes heat and allows it to be suitable for not only traditional cooktops, but induction tops as well. The 32 cm Appety frying pan has a tediously rounded skirt and bottom, guaranteeing no sharp corners and simplified content control. 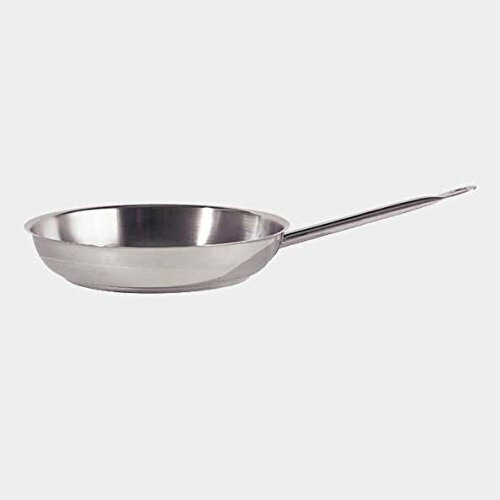 In addition to excellent content control, each pot and pan comes with an ergonomic stainless steel tube handle. The handle, designed to promote a cooled, easy grip, is welded at multiple points and permanently marked for traceability. In addition to these carefully crafted features, Appety cookware boasts an attractive mirror polished finish on the stainless steel that allows each piece to be durable and long lasting, as well as cleaned simply, utilizing a dishwasher. Stainless steel tube handle welded in multiple points promotes a sturdy, cooled grip.